When the lovely Laura from AJC discovered I was living it up in South West London, she gave me a shout to ask if I fancied heading over to one of the newest Rush salons to check it out. Despite it only being a stones throw away from where I live till I visited Rush Wandsworth, I didn't even know the Southfields shopping centre existed; and much as the Westfield malls have all the stores ever, I'm not such a fan of how busy they get... Southfields is much smaller, but has most of the shops you'd want and of course Rush Wandsworth too, even better huh. I popped along for a wash and blow-dry* at Rush Wandsworth on my day off, a spot of pampering before heading out with my friend Jess that even for a few drinks. If you're looking for a luxurious destination to get yo' hair did south of the river, Rush Wandsworth could well be the one for you. Tony (the franchisee of Rush Wandsworth) made sure my hair was in tip top condition with Kerastase products for a sleek blow-dry. 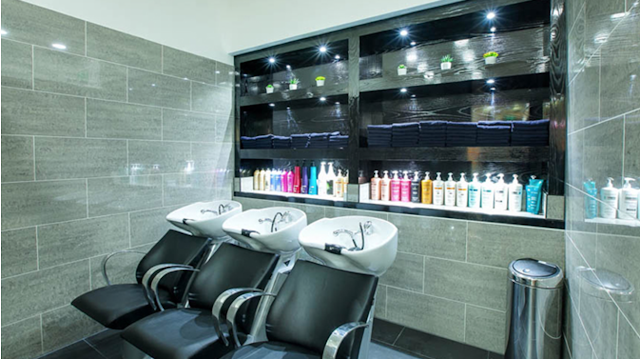 Rush Wandsworth is open 7 days a week and will have your hair looking tip top in no time. Thanks again to the lovely team at Rush, I'm glad to have finally found a local hair salon nearby me! Cause good hair days, must be documented with a selfie obvs... So good in fact that a woman stopped to tell me at the bus stop, how much she loved my hair, those little things eh. Cheers Rush!